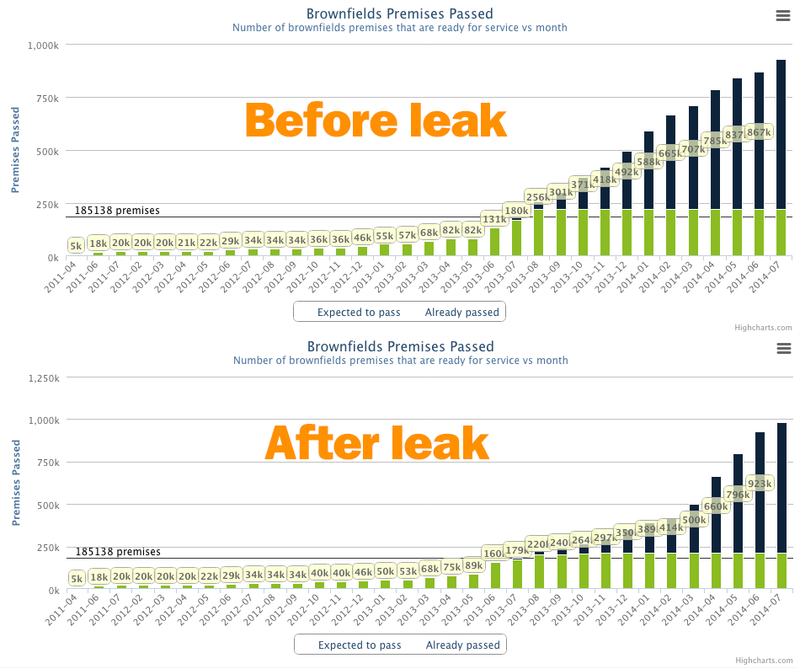 After tonight’s earlier post, I have along with JXeeno of myNBN.info have taken the time to model the newly discovered rollout delays into the statistics system over there and graphed them out. The results are published below, and are very troubling for NBNco and supporters of the project. The impact of premises passed and able to connect to the NBN in the next 8 months will grow much slower than previously anticipated. The biggest problem you will see here is that the growth of connected premises will have a significant hole up until April 2014 when the growth of premises passed will start to come on stream properly. NBNco has consistently called this the ramp up. We have already have seen the initial ramp-up in May, June and July this year, where the active premises has jumped considerably, adding well over double the amount of previously passed premises. So what happens when you do not pass premises? Well for one, they cannot connect. Now with NBNco looking for all the revenues it can get while paying Telstra the first $7million of it’s disconnection bounties, it would seem that you would want people on the network as quickly as possible. Making the total market size smaller will only reduce the increases in revenues which NBNco would have dearly loved. It is way too early for any real data on exactly how bad this will be. The only silver lining is that with take up rates very strong and at higher speeds than anticipated, NBNco CEO Mike Quigley stated at the Joint Parliamentary Committee in Sydney on April 19th that they were was expecting to beat its $15million revenue target for FY13. This along with Connectivity Virtual Circuit (CVC) charges which have been levied against RSP’s for allowing bandwidth onto the NBN Network to their customers has also been much higher than budgeted and is also helping significantly to the revenue base of NBNco and certainly faster than was planned. It will take time to model exactly the impact of these figures, but data of takeup rates due to be released under FOI requests in the next 3-4 weeks will help. Thankfully, the numbers planned for completion in May 2014 are almost back on par with previously planned number, while June 2014 will see the deficit being cleared completely and beaten by around 56,000 premises, while July 2014 is now also ahead of the previous forecasts. But the damage will have already been done and the revenues since earlier in the financial year will not have been there. Get your Fixed Wireless towers up, right now. Time to push Ericsson to pull back the deficits in all states, and especially WA and SA. You need to be ahead of plan by the end of this calendar year, and the towers not only need to be active but have active RSP’s on their Points of Interconnect (I’m talking about Dubbo WSAMs and also 2HOM-01 recently where the FSAM was activated but Lidcombe POI was not. I am sure there are other examples. Make sure that areas already active have sufficient resources applied to them in order for connections to be made. Horror stories on Whirlpool of people going to the back of the line due to either civil works required, or contractors just not turning up because it was a bit wet simply is not good enough. An appointment missed is revenue missed for 2 months. Get more MDU’s on deck. Your contractors dealing with them are slow and inefficient. Your communication to Owners Corporations is rather dire where nobody knows what is going on and contractors have not got the information. Make a database that can be searched along with the name of the MDU, the address, and the contact point of the Owner’s Corporation if known. Has the MDU made contact with NBNco? Has permission been granted by the Owners Corporation to have the fibre installed? This would all help people chase their development for you.